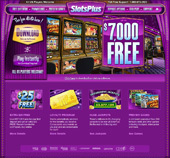 Slots Plus Casino offers some of the most exciting online slots games around. This casino is owned by Mainstreet Vegas Group, which is incorporated in Panama City, Panama, and licensed by the Government of Costa Rica. The casino has been certified for randomness and fairness by Technical Systems Testing, an independent testing and certification agency that is respected by the entire online gaming fraternity. The casino offers a slew of bonuses and promotions, including a double match welcome bonus, a second deposit bonus, weekly bonuses, and more. It supports multiple currencies and transaction methods. Customer support is available 24×7 at this casino, which is open to players from the USA. Security: Slots Plus Casino provides complete security for players’ transactions by using industry-standard 128-bit secure socket layer (SSL) encryption technology. New players at Slots Plus are treated to a fabulous 400% match bonus of up to $10,000 free as the welcome bonus. Other bonuses include weekly bonuses, a $1000 weekly reward, a quick verification bonus, and also a referral bonus. Players also get a chance to participate in tournaments that the casino organizes from time to time. The Slots Plus loyalty program is a three-tiered program that gives players a chance to earn higher bonuses and incentives as they move up the tiers in the program – from the Silver tier through the Gold tier to the Platinum tier. For starters, every player gets comp points for each real money wager they make at the casino. Slots Plus Casino is powered by superb software from Real Time Gaming, a name that is respected across the entire online gaming software development industry. The software is available in download as well as instant play modes, and provides the casino with more than 200 exciting games, a majority of which are slots, as the name suggests. The casino also has table games, video poker, specialty games, and progressive jackpots. At this casino players can try out the unique Real Series slots, which are available only at RTG casinos, along with the usual classic slots, video slots, and progressive slots. All wagers are made in US dollars at Slots Plus Casino, though the casino allows players to make deposits in their respective currencies, which are then converted to the equivalent dollar value. The casino supports multiple payment methods. Credit Cards (Visa, Master Card, American Express, Diners Club, JCB), ClickandBuy, INSTADEBIT, MST Gift Cards, Skrill (Moneybookers), Money Order, NETeller. Check Via Regular Mail, Check Via Courier, ACH Direct Deposit, Neteller, Skrill (Moneybookers), Money Order, Wire Transfer. Customer support is available 24×7 at Slots Plus Casino via live chat, e-mail, and telephone. The casino has a toll-free number that players can call for answers to their queries. There is also a FAQ section at the casino that players can check up for answers to questions that are commonly asked at online casinos.